I’m in the mood for some cake and some ladies. Get your mind out of the gutter, I’m talkin’ ’bout Let Them Tweet Cake. This event that I try to regularly attend is just a bunch of ladies (and a few gents) talking tech at a dessert shop, Sweet Surrender Dessert Café. We let our geek flags fly HIGH. It’s been a while since the last Tweet Cake, but this tweet-up is right on time for me. I’m excited to see old friends and meet some new ones. Sweet Surrender Dessert Café, 1804 Frankfort Avenue, Louisville, Ky.
Blogger’s note: Interested in a $20 discount for the next Dishcrawl Louisville event (a bourbon-themed, Derby-centric crawl through Fourth Street)? Leave a comment on this post that answers the following question: “What is your favorite part of Derby?” For two extra chances to win, like Dishcrawl Louisville on Facebook and follow Dishcrawl Louisville on Twitter, then come back and tell me you did all that. You have until 11:59 p.m. Sunday, April 21. I’ll announce the winner on Monday, April 22. Bad things happen when I leave my phone in the car. 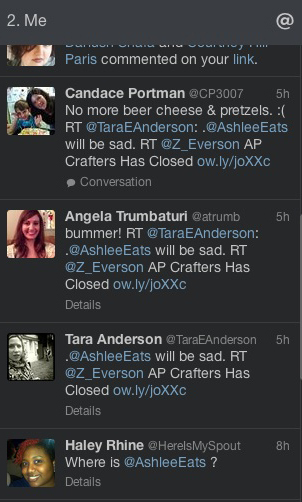 AP Crafters Kitchen and Bar is closed? Eater Louisville had the scoop, and AP Crafters’ website just confirms this sad news. I can’t believe AP Crafters is gone. No more pretzel breadsticks. No more gummy bears on the way out. NO MORE BEER CHEESE BURGER. If anyone has any answers for this loss or remembrances, please take it to the comments. I need to drink this wine and hold Roscoe tight. And remember, keep your phone on you at all times, or your favorite restaurant gets it. Post your comment by 11:59 p.m. Wednesday, Jan. 16. I will choose two winners (one voucher each) on Thursday. A friend asked me why I was @ashleeclark on Twitter rather than @AshleeEats. The Twitter account came literally years before this blog, but it’s time for an update. You can now find me on Twitter as @AshleeEats at twitter.com/AshleeEats. Thank you to everyone who took the time to take the Ashlee Eats Improvement Survey. Forty-eight people participated and left thoughtful feedback. I am sincerely touched by the kind, honest responses I received. You guys are awesome. Here is a breakdown of the questions and the top two responses for each.